Working in a LAN Center has it's ups and downs but one of the major perks is our community. Everyday you get to work with customers who tend to play games together, due to the way a LAN Center functions. We can play League of Legends together, Overwatch, Minecraft, etc, etc, while we sit next to each other and interact in a homey environment. Despite the unique position of LAN Mob and other game centers, these types of interactions have taken a blow in the last few years. Nowadays it's all about online multiplayer and massive internet experiences, which is fine, but there's distinctly a difference between interacting with people over a voice comm and being in the same room. 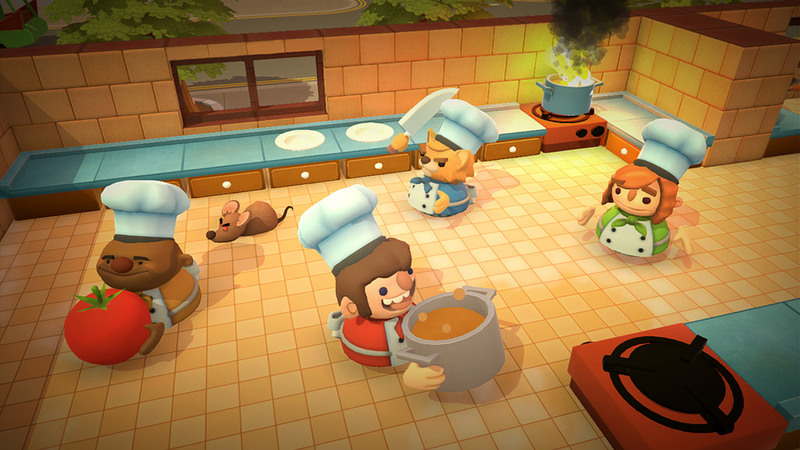 The latter, typically known as couch co-op, is a bit of a rare commodity in this age of gaming, and I'm happy to say "Overcooked!" is nothing short of a delicacy in this regard. Ghost Town Games' Overcooked! is an incredibly chaotic 1-4 player couch co-op arcade game, in which you cook meals for you customers in an allotted amount of time in order to develop your skills as a chef so you can Chef so hard you defeat a giant spaghetti monster. Sounds relatively simple right? Well I got a group of my closest friends together, including Slooze (for a while before he hung up his toque) and Connorkaze and we tackled the challenge of Overcooked! Things started off well with calm and collected planning and executions, with communication like - "Hey man, grab me a bun. Thanks dude!" and "Sure I'll chop these tomatoes up real quick!" As we continued to progress in the game's campaign and later into the night, we were slowly pushed to our limits of cooperation. Communication quickly devolved into what I imagine it's like to work with Gordon Ramsey, "WHO PUT THIS ONION HERE?! ", "I said TOMATO not LETTUCE!" and even, "Deliver this burger or I WILL KILL YOU." You don't truly know a man until you've tried to make virtual space burritos with them. It's all fun and games until somebody drops an onion. To put it simply, Overcooked! 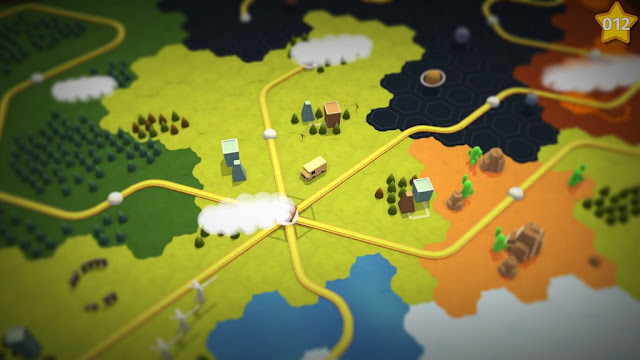 is a bit of a puzzle game. 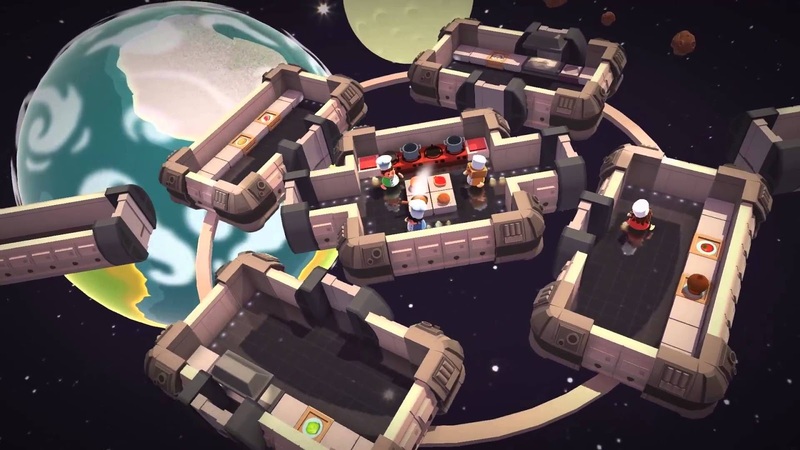 The game provides the players with a kitchen, a recipe and a list of orders, and it's up to your team to come up with an efficient way to fill the orders in the time allotted. Early on all of these aspects are simple, with soups that only require a single ingredient and actual functioning kitchens. In these early levels it's relatively simple to develop an assembly line the likes of Henry Ford has never seen. Player 1 - I'll deliver vegetables to Player 2! Player 2 - I'll chop up vegetables and deliver them to Player 3! Player 3 - I'll cook the vegetables into soup and put the soup in a bowl! Player 4 - I'll deliver the soup to the window and clean dirty dishes! Player 2 - Player 1, get your act together! Guys I think I have a plan! Player 4 - This is on fire. This is all on fire. Despite the inexplicable drop in our stomachs as we loaded into the newest kitchens, it took a decent amount of time before our team of crack Chefs fell apart. Sometimes a kitchen would look so unfair at first, but with some communication and planning, we were able to 3-Star (best rating possible) them. Some kitchens we did not fare so well against. 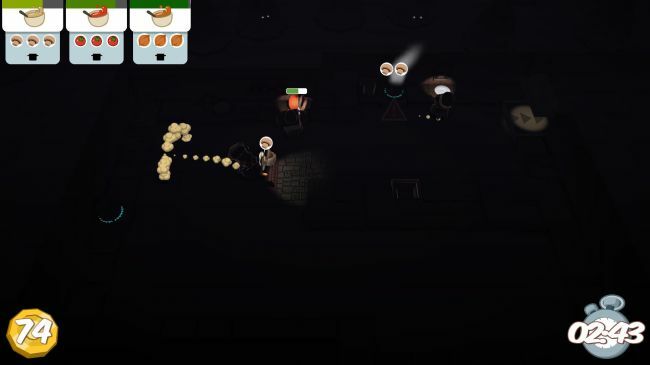 There was one kitchen specifically, in World 4, where the lights were out and all chefs were equipped with a small flashlight. I cannot put into words the panic that ensued. Every once in a while lightning would strike, illuminating our work area and it took everything I had to not crack up. Why were we even trying to serve food in the dark? Is this legal? Who chopped up 5 tomatoes and put them on the floor? Doesn't matter, we got 1 star and decided to move on. Cooking in the dark is a skill we are not ready to hone...yet. That's the beauty of Overcooked! Each level is a new experience, allowing you to develop and execute a plan for the increasingly difficult kitchens and recipes. It doesn't want you to meticulously have a plan for every level at first, you have to think on your feet the first time around and go from there. The level design is excellent here, sadistic as hell itself, but excellent. Even the kitchens we found incredibly frustrating were something to step back and admire. Overcooked! 's level design isn't the only exemplary ingredient in the dish though. Overcooked! is relatively simple to control, our experience was on the PS4. You move with the left stick, pick things up or put them down with X, chop ingredients with square and lastly you can fling yourself with a burst of speed in a direction by pressing Circle. Outside of movement, that's only 3 buttons but that's all you need. However, the more we played we were discovering small skillful feats. If we were to dash in a direction and attempt to drop what we were holding, we could throw it. This was very useful in a level where we were forced to cook on the roof of two trucks speeding down the road. When we were comfortable with dashing in general, we moved much quicker, dashing from station to station with the swiftness of a young sous chef. We were even strangely capable of dashing precisely on ice, let's see Wolfgang Puck do that! For being so easy to pick up, Overcooked! rewards you for taking the time to master. Kind of like cooking in general, yeah? Visually Overcooked! is charming. Characters, kitchens, ingredients, and even the washing dishes animations are delightful. As you progress you unlock more additions to the colorful cast of Chefs you have to choose from including an angry Italian man, a dopey French guy, a cat?....and a paraplegic raccoon. Yeah, it's fine, don't worry about it.... After spending a decent amount of time with Overcooked! I can say any other art style just wouldn't feel right. The soundtrack is also great, with a carefree harmonica theme to accompany the breezy visuals of the over-world hub. Inside the kitchen, the soundtrack shifts to a faster paced, sometimes downright frantic sound, with the cherry on the cake being the last 10 seconds of a level, where the tempo increases very dramatically. My experience with Overcooked has been solely as a group of 4, but I believe it is the most challenging and hilarious way to play the indie title. Despite all the chaos, when our team of 4 was capable of pulling off these triumphs over cuisine it felt like we were a well oiled machine. I think Overcooked! can be criticized for having no online co-op and an insanely weak single player experience, but I just don't believe it was designed for that. Overcooked! wants you and some of your friends to dig deep and communicate in the same room, and I think that's fine. 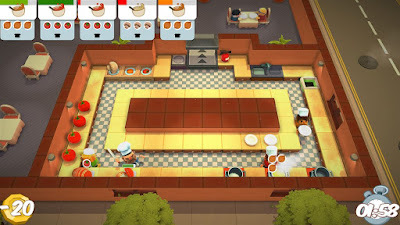 In a day and age where you just don't get to see these great couch co-op games cropping up, Overcooked! leaves a chaotic yet rewarding mark among my personal favorites. Overcooked! is the type of game to pull out for a party, it's rowdy, it's hilarious and most importantly, it's well done. I feel like I could've crammed more cooking puns into this, but definitely check out Overcooked! if you have a group of friends to tackle it with. Just make sure you guys agree to NOT harm one another before you start. We'll be streaming Overcooked! in the future, I'm sure of it, to anyone unfamiliar with our Twitch channel I'll link it below! Along with Ultimate Chicken Horse, Overcooked! has a lot of potential to flourish in the right hands and leads to some real funny situations, one of which I'd like to share with everyone. We were exhausted. One might say we were Overcooked! After an entire night of high octane cookin' we were ready to turn in. I felt fried, not unlike the fish and chips we prepared in the arctic, not even hours ago. We were nonchalantly taking a look at our next kitchen, deciding if we were capable/willing to take it on just yet. The kitchen was a multiple meat burrito space theme with a cross-map counter separating 2 of us from the other 2, with a switch on the ground used to open a door for ingredients and chopping boards. Tyler and Anthony were on one side, while Connor and myself were on the other. Then it all got dark. Connor, utilizing his dash ability, attacked with the forcefulness of a thousand baboons, pinning me into the corner. I was playing the young paraplegic raccoon chef, a character that resonates with me deeply. As I desperately tried to escape 2am unhinged Connor, wondering what has happened to one of my dearest of friends, our kitchen caught on fire. It seemed in all the homicidal action, we neglected our jobs as space chefs and our chicken was burning. As my young raccoon life flashed before my eyes, I managed to wiggle my way to the fire extinguisher. I tried to overpower Butters, but he was a man on a mission and I was a handicapped raccoon. The world is cruel. Eventually I was able to maneuver near the fire extinguisher and put it out, netting me an achievement, a legendary screenshot and a near asthma attack from laughing so hard. I'm not sure if I'll ever look at Butters the same. The burden of space burrito preparation really changes people, man.